will suffer financial loss, damage to your reputation or an increase in your competition. What is the most important data in your company? Ever sent email to the wrong person? Or lost a USB drive? Data leaks can certainly be accidental, but sometimes, even frequently, data is leaked on purpose. All it takes is one unsatisfied employee. Your company needs data security software that guarantees your rules will be followed, your important data is secured and your processes are transparent. 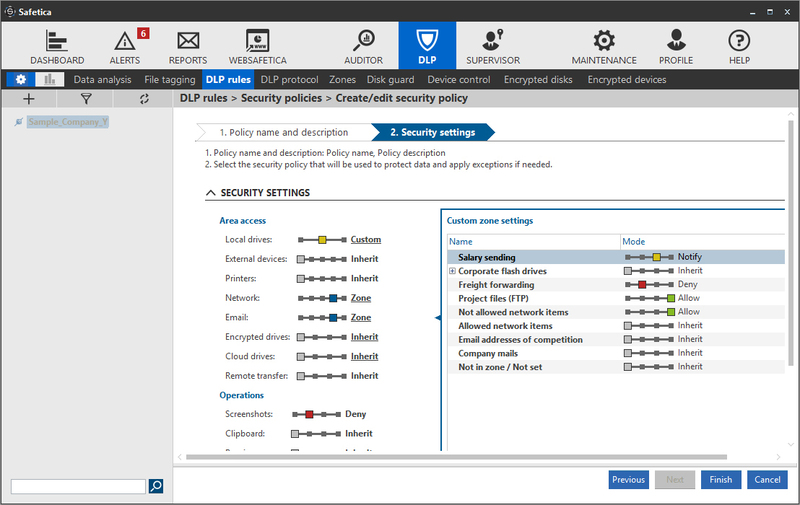 PCs, laptops, phones and tablets with Safetica Client Activity is recorded and policy rules enforced via a client application (optionally hidden from the users). and Database Data is automatically transferred from network computers to the server upon connecting to the network. Manager's dashboard with settings and outputs This is where all the settings can be adjusted. Here you can also get a picture of all the collected data. Safetica can tell when somebody is taking chances with your confidential information. Depending on which mode Safetica is operating in, it can either block the risky activity, inform an administrator, or remind your employee about your security guidelines. When you need to take a sensitive document out of your company (like on a USB), Safetica makes sure it is encrypted. So nobody can get ahold of your data unless you authorize it. You are safe even if a USB disk gets lost or stolen. With Safetica, what’s yours stays yours. The retail car business is extremely competitive. Customer databases frequently get leaked to the competition. BMW Invelt wanted make absolutely sure that their customer data would stay safe. That is why they chose Safetica Data Loss Prevention software. See how BMW Invelt protects customer data with Safetica DLP.